The Tower of David also known as Jerusalem Citadel, is an ancient citadel located near the Jaffa Gate entrance to western edge of the Old City of Jerusalem. Tower of David as seen from the Phasael Tower, over looking the citadel courtyard. The minaret is not part of the original complex, it was added much later in 1635 by the Turkish rulers. The citadel that stands today dates to the Mamluk and Ottoman periods. It was built on the site of a series of earlier ancient fortifications of the Hasmonean, Herodian-era, Byzantine and Early Muslim periods, after being destroyed repeatedly. The Solomonian main entrance to the citadel. It is the outer section of a draw-bridge that allowed access to the inner entrance to the citade. The citadel was expanded between 1537 and 1541 by the Ottoman sultan Suleiman the Magnificent, whose architects designed a large entrance, behind which stood a cannon emplacement. 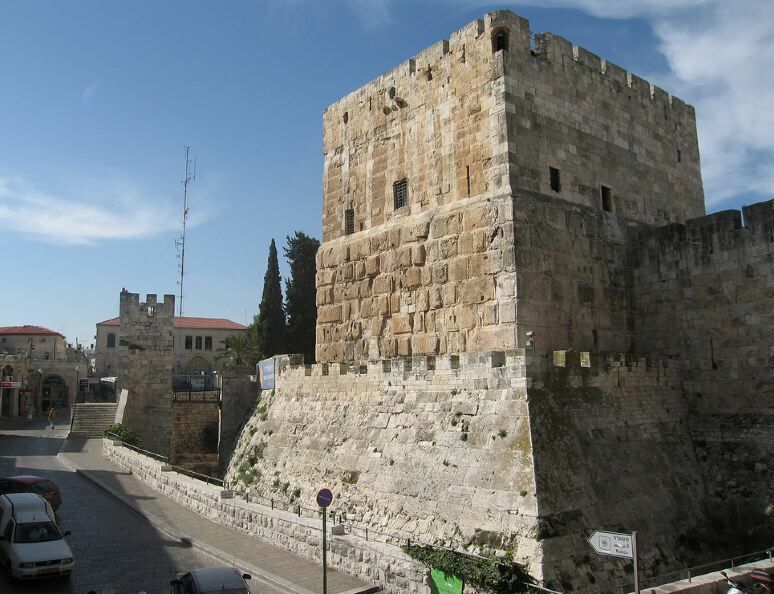 The Phasael Tower, partially preserved in the Citadel of Jerusalem has been identified as either the Phasael Tower or the Hippicus Tower described by Josephus. Of the original tower itself, some sixteen courses of the original stone ashlars can still be seen rising from ground level, upon which were added smaller stones in a later period, which added significantly to its height. Herod named the tallest of the towers, 145 feet in height, the Phasael in memory of his brother who had committed suicide while in captivity. The Model of Jerusalem by Stephen Illes is a 1:500 scale model of the city of Jerusalem, originally exhibited at the Vienna World Fair in 1873 CE. The scale model reflects the city under the later stages of Ottoman rule. 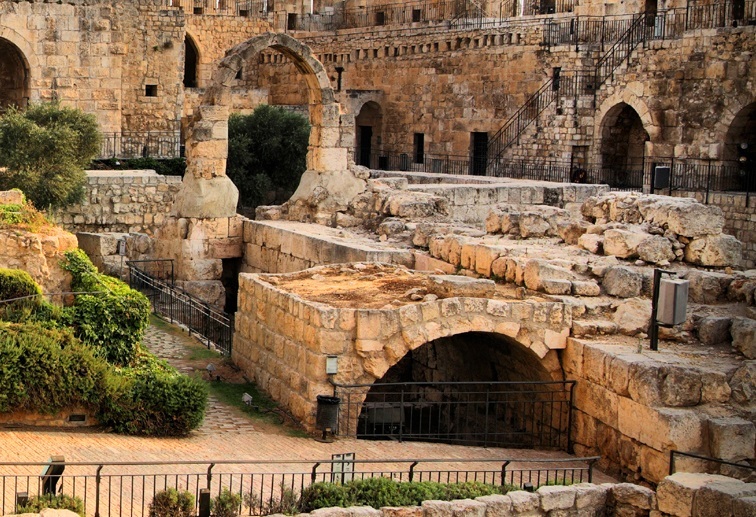 It is currently among the exhibitions at the Tower of David Museum in Jerusalem. Masjid al-Qala'a, orginally built during Mamluk period probably. First definitive mention of the mosque is from 1531-32 CE during it's reconstruction during the reign of Caliph Suleiman. The mosque functioned as an open-air area for prayers and has no distinctive external facade. The mosque is closed to public as of December 2015. Byzantine Cistern (arched structed in lower foreground), to collect rain water. This is one of the fragmentary remains of fortifications, walls, cisterns and a lintel engraved with a cross, date to the Byzantine period. The rounded corner tower measuring 10 m. in diameter, from which 4-m. thick walls extend to the north and to the west. During Muslim rule in the 8th century CE, a new citadel was established. The precise plan of this citadel is not known, as severe damage was caused when the Crusaders built their citadel. It was located in the south-eastern corner of the courtyard. Probably this tower stood at the corner of a new wall, which ran north and south. If we assume that the Arabs left the Hasmonean/Herodian wall as their western limit, the outlines of the Arab fort become clear. Remains of Hasmonean/Herodian ear wall, which was strengthened by Herod and later rulers, runs north-east to south-west through the inner archaeological garden. This segment of the wall which surrounded Jerusalem during Hasmonean times (2nd century BCE runs through the courtyard. 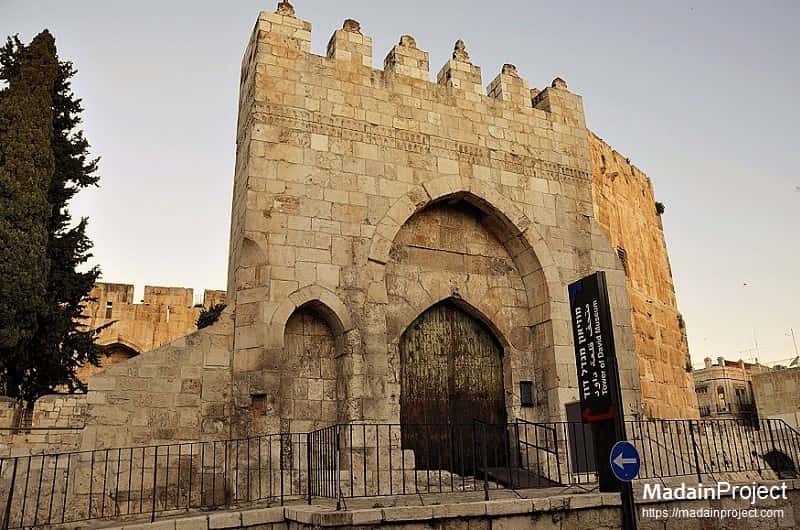 This wall was referred to as ”the First Wall” by Josephus Flavius and received its name as it was the first of three walls which surrounded Jerusalem during the Second Temple period. In Herod’s time and in the later Byzantine period, additions were made to the wall. 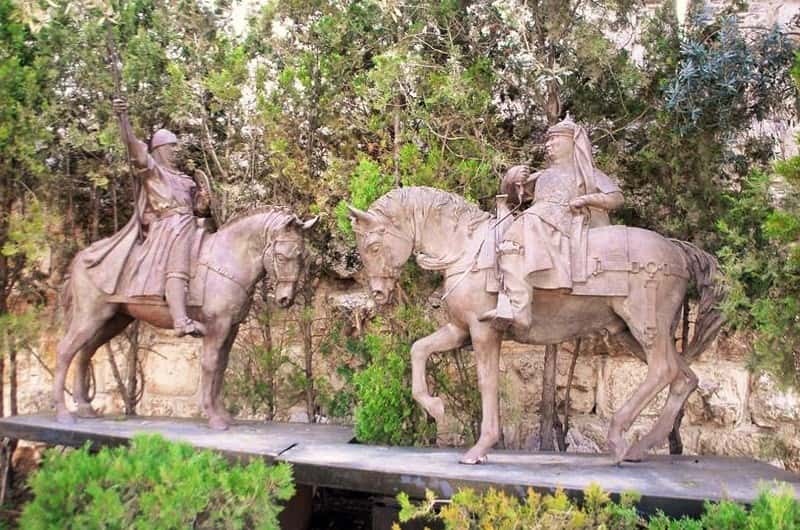 Saladin (right) and Richard the Lionheart (left), King of England, an equestrian statue in front of David Citadel. It is one of the several reliefs installed at and around the Jerusalem Citadel including a 19th century model of Jerusalem, Statue of King David. 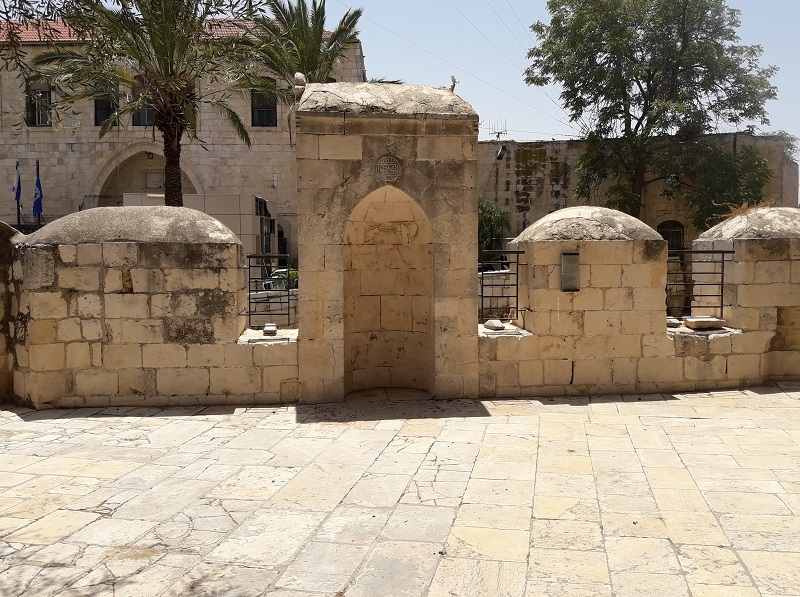 The Kishle was erected in 1834 by Ibrahim Pasha who governed the Land of Palestine from Egypt. It can be accessed from the dry moat which surrounds the Citadel or through a Crusader era hall in the Museum. 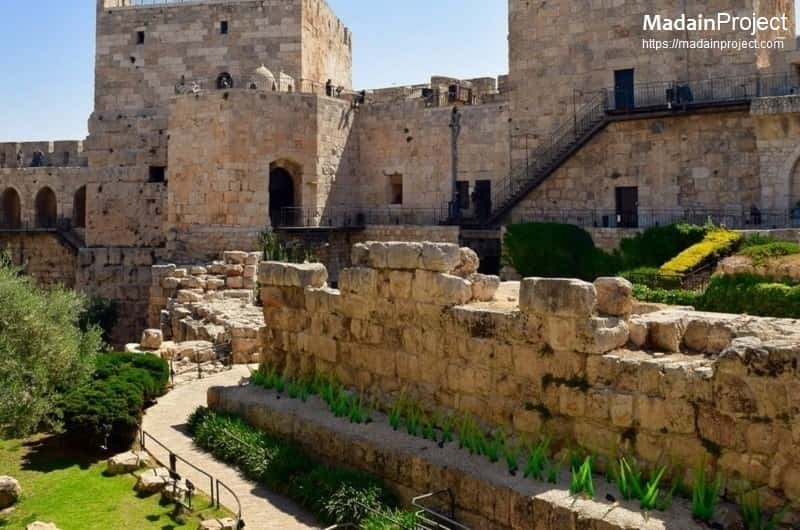 Archaeological excavations have unearthed remains from as early as the 6th century BCE and walls from the time of King Herod as well as evidence from the Middle Ages. Of particular importance are the discoveries of a wall and other findings from the First and Second Temple Periods. 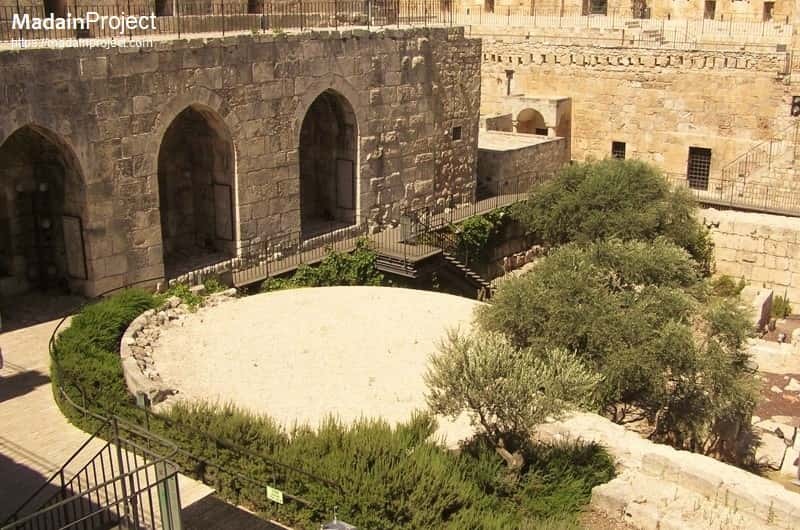 Masjid e Sayf is located within the Qal'a (Citadel ) of Jerusalem, along the southern part of the Citadel's eastern barbican. Sultan Suleyman I ordered a major restoration of the Citadel, including this mosque, in the early Ottoman period, as the mihrab bears the name of Sulayman al-Qanuni (The Lawgiver). Since the second half of the 16th century the mosque underwent some aletrations. In 1151H/ 1738 AD, it was restored by 'Ali Agha, the chief of the Janissaires in the Citadel.